The ConFlex consortium aims to train next generation of researchers on the control of flexible structures and fluid-structure interactions, using and also contributing to the latest advances in control theory and energy-based modelling. The ConFlex consortium comprises a group of 15 academics with expertise in control theory, complex dynamical systems (in particular, distributed parameter systems (DPS)), fluid dynamics, aeroelasticity, power electronics, swimming theory and marine engineering, working in either mathematics or engineering departments, with a strong history of internal collaboration. ConFlex academics are located at 10 beneficiary nodes in the United Kingdom, France, The Netherlands, Spain, Germany and Israel. The ConFlex consortium also has four academic partners (located in USA, China, Canada and France) and 11 prestigious industrial partners. ATo develop advanced modelling and analysis tools suitable for control of flexible structures, possibly subject to fluid-structure interactions, as well as structure and passivity preserving model reduction. This requires a systematic theory for modelling and control of coupled DPS, which allows understanding how properties such as controllability or passivity are inherited by the coupled system from component subsystems. A very effective tool is the recently-developed port-Hamiltonian framework, which is now being extended to DPS. The modelling and stability analysis of fluid-structure interactions is under sustained development, and has led to a better understanding of the well posedness and stabilization of relevant models. The members of this team have played a key role in all the developments described above. BTo develop powerful control design methods for the models arising from the research in (a). These will be based on internal-model-based techniques, to solve different versions of the regulator problem (that is, reference tracking in the presence of disturbances) and nonlinear model predictive control, specifically tailored to flexible or aeroelastic systems. Importantly, ConFlex also aims at developing a systematic methodology for the network-friendly implementation of the new algorithms. A special attention will be paid to implementation architectures that are robust to uncertain parameters. The fact that this is done on nonlinear DPS makes this task very challenging. CTo apply the techniques developed in (a) and (b) on innovative engineering solutions. These include the modelling and stabilization of flexible structures such as wind turbine towers using tuned mass-dampers, vibration reduction of wind turbine blades using controllable flaps and aeroelastic tailoring, gust load and flutter control for helicopters and aircrafts, the modelling and control of vibroacoustic systems using smart skins, stabilization of micro actuators in interaction with fluids at the nanoscale, tracking for wafer stages, the safe control of farms of wave energy converters and the control of connected marine vessels in salvage operations. Subject: The control and stabilization of coupled distributed parameter systems, with applications to vibration reduction of wind turbine towers and wafer stages. Subject: Control and stabilization of nonlinear flexible structures coupled to fluid flow with applications to flutter problems in aero-elasticity. Subject: Port-Hamiltonian approach to the modelling and control of flexible structures. Subject: Passive and active control to suppress the vibrations of wind turbine blades. Subject: Control of fluid-structure interactions with applications in marine engineering. Subject: Stability analysis of coupled passive systems with applications, to be recruited by Tel Aviv University. 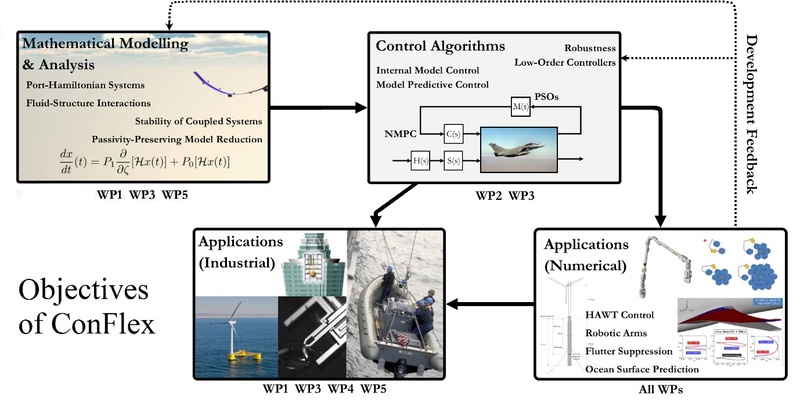 Subject: Vibration reduction of monopile and floating wind turbine towers using multiple TMD systems, to be recruited by University of Warwick. Subject: Position control of a wafer stage, to be recruited by University of Twente. Subject: Mathematical network modelling of nonlinear fluid-structure interaction, model reduction, uncertainty quantification, to be recruited by Friedrich-Alexander University of Erlangen Nurnberg. Subject: Model reduction and robust control of aero-elastic wing models, to be recruited by Universidad Autonoma de Madrid. Subject: Approximation for control of port-Hamiltonian systems, to be recruited by University of Twente. Subject: Optimal control of port-Hamiltonian systems, to be recruited by Bergische Universitat Wuppertal. Subject: Energy based robust control of nonlinear port-Hamiltonian systems, to be recruited by Universite de Franche-Comte. Subject: Energy-based control of flexible structures with aerodynamics forcing, to be recruited by Imperial College London. Subject: Aeromechanical modelling and stabilization of large floating horizontal-axis wind turbines, to be recruited by Imperial College London. Subject: Passive/active load alleviation strategies on wind turbine rotors, to be recruited by University of Warwick. Subject: Modelling, analysis and identification for rigid bodies interacting with water waves with application to wave energy converters, to be recruited by Universite de Bordeaux. Subject: Control and identification for floating or immersed rigid bodies connected by deformable cables, to be recruited by Universite de Bordeaux. Subject: Prediction and control strategies for the launch and recovery of small craft in high seas from large mother ships, to be recruited by University of Exeter.